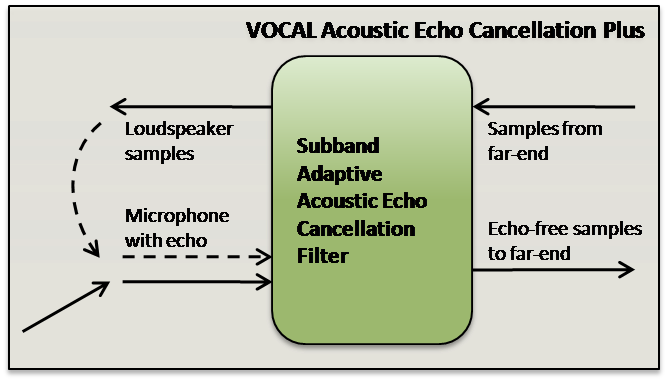 VOCAL Technologies, Ltd. announces its release of their Acoustic Echo Cancellation Plus software with a more enhanced solution to the acoustic echo problem then your standard methods. It provides built-in speech enhancement, automatic gain control (AGC), and automatic echo tail search for superior voice quality and ease of integration for your product. The built-in speech enhancement, noise reduction and automatic gain control provide additional voice quality enhancements to the AEC module. Instead of having a separate post-processing module, these additional algorithms are executed by the same function call as the AEC algorithm. The noise reduction algorithm also works in the same subband domain as the AEC filter and non-linear processor(NLP). Reduced algorithmic latency and lower computational complexity are some of the benefits of doing noise reduction in the same module as the AEC. Most noise reduction solutions are done in the frequency domain, which requires a FFT and an IFFT that results in an additional 10-20ms of latency. The finishing touch on the AEC output is the application of AGC. AGC adaptively adjusts the output signal level to a configurable target signal. This prevents users on the far end from having to adjust the speaker volume when switching between talkers who speak quietly and those who talk loudly. The automatic tail search feature allows you to integrate our AEC solution without the need for tuning the echo path delay. This echo path delay estimation is especially useful for implementations which use the same software, but the underlying hardware changes. This problem exists in applications implemented on Android devices and televisions. 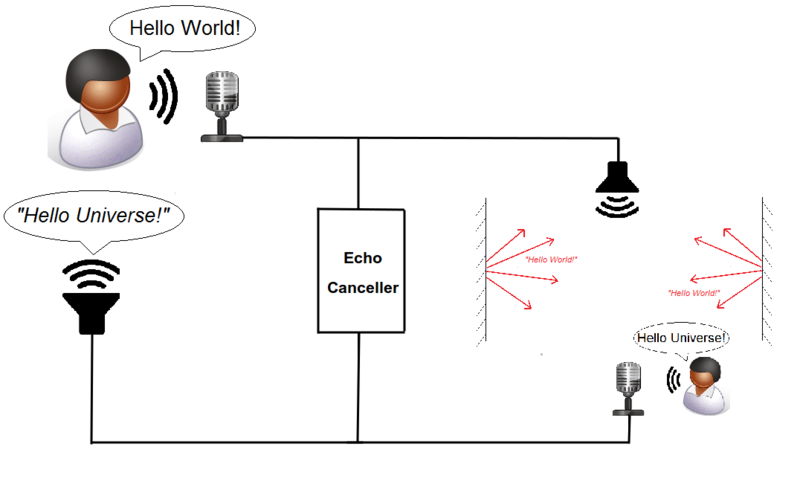 On Android devices, the echo delay can vary from model to model, and for TVs the echo delay can vary not only from model to model, but most models have different operating modes which can affect the echo delay. For example, on new TVs there exists a “game mode”, this “game mode” is designed to have lower latency in the audio and video streams than the other operating modes, which is desirable for video game players. This variance in echo delay can be a nuisance for software developers that need to tune echo delay for each model or operating mode. This delay estimation feature eliminates that additional tuning for these scenarios. VOCAL’s Acoustic Echo Cancellation Plus is a software library is available on a wide variety of DSP’s and conventional processors from TI, ADI, Intel, ARM and other vendors. Contact us to discuss your software requirements.